I started asking Liana about her costume early this year, to make sure that I had enough time to prepare everything. It’s probably really silly, but I felt like I had something to prove to myself. I like making the costumes myself, because I very fondly remember my mom doing the same for me and my sister as we were growing. Sometimes only telling her a day or two before the event that we needed costumes, and what we wanted to go as. The last few years, there were some definite high- and lowlights with the costumes. The first year, Liana was Supergirl (and there was probably never a chunkier version). All was self-made and self designed and I loved the outfit. The next year, I started making a Rapunzel outfit, but my sewing machine broke in the middle of the process. As frustrating as it was, this meant we really had no other choice but to buy a princess dress for her. The fabric remains of the failed dress are still haunting my crafty area. Last year, it was all about Doc McStuffins. It was a really enjoyable outfit to make, because it challenged a whole host of different crafts. I was sewing the doctor coat, knitting the stripy jumper and colouring existing shoes purple and adding glitter. It looked great, and was really recognizable, we had a few people sing the some of the Doc songs while we were waiting in line for our traditional visit to the local tourist attraction on the Halloween Bank holiday. At the same time though, I was acutely aware the entire time that the doctor coat was not sewn very well. 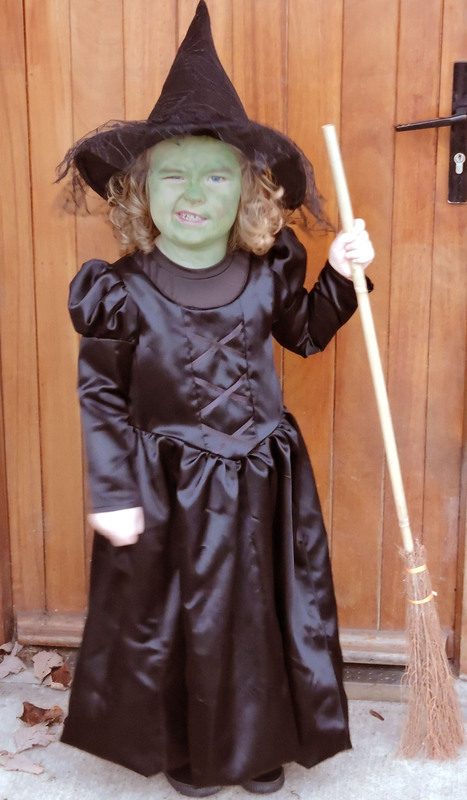 For this year, Liana requested to be the Wicked Witch, which gave me the chance to reuse the pattern that I purchased for the Rapunzel dress. I found a Simplicity pattern for the wicked witch online as well, but unfortunately my local sewing store wasn’t able to order it in. To be honest though, I am glad that I didn’t buy anything new, because, the dress really worked out pretty much the way I wanted it to. There were a lot of bits from the pattern that I left out (underskirt, fusible interfacing, the cords at the front etc.) to keep it simpler and to make it more witchy. There were a lot of new skills that I learned while I was working on this and there are a few little things that are a bit fudged, but I can absolutely live with that. Liana is currently such a weird in-between size (height of an average 5 year old, but wears at least size 6-7 years in almost all clothes) I picked the biggest pattern size. Always easier to take away than to add, isn’t it? In the end, I needed to take a little away at the sleeves and take the skit up quite a bit. W found that out the hard day the first day Liana wore the outfit, as I had only shortened the skirt with some provisional stitches, which she walked on and ripped right out. Those were fixed by the next outing and she was having some much fun. We still have the Trick or Treating to go on Saturday, but I can already say, the outfit has been a success. What do you think?